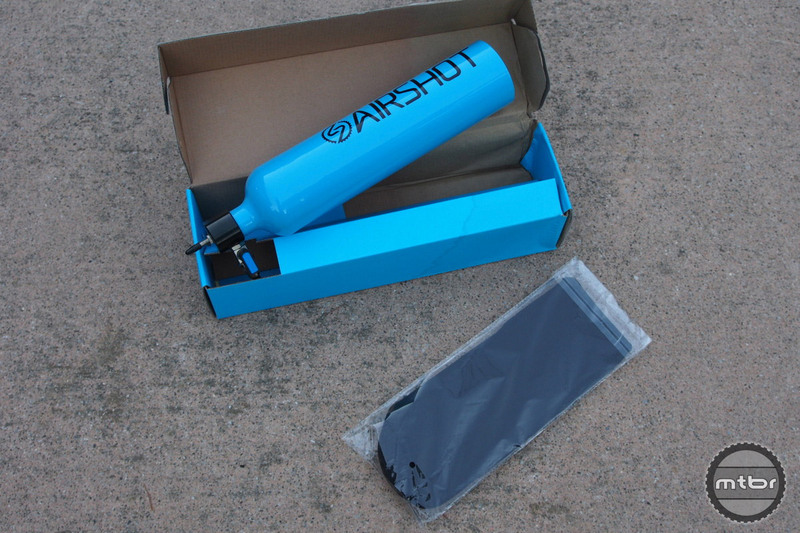 Airshot Tubeless Inflator packaging and sleeve (click to enlarge). Tubeless tires are here to stay. Their benefits when it comes to flat prevention and increased traction have been been proven repeatedly and both industry and consumers have seen the light. But adoption has not been sweeping as most bikes are still sold with tubes. Often the cyclist has to convert the bike to tubeless themselves. One of the key obstacles with tubeless has been ease or difficulty of installation. It is simply an unpredictable task when inflating a tubeless tire without a compressor for the first time. 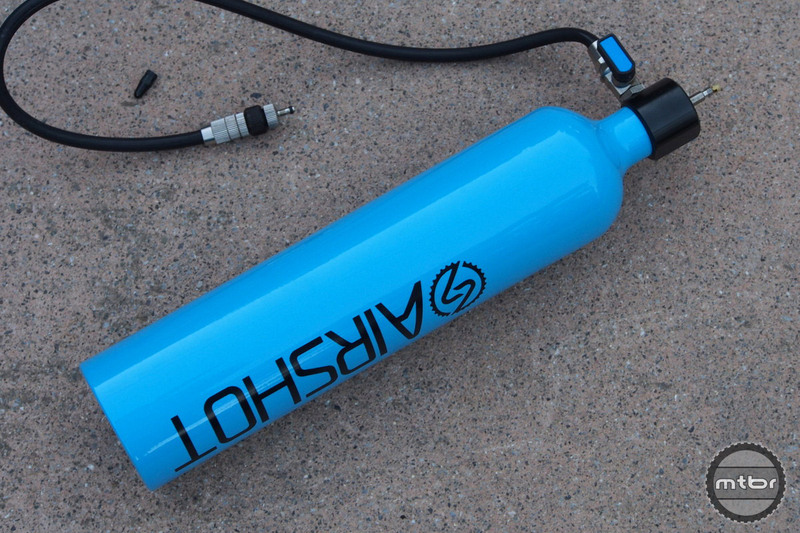 Airshot Tubeless Inflator is 1.15 liters in capacity (click to enlarge). Compressors deliver a shot of air to push tires against the sidewall to initiate the seal required to air up a tubeless tire. It can sometimes be done with a floor pump and some tricks of the trade. But ultimately, there will be a tire and wheel combination that will not air up without compressed air. 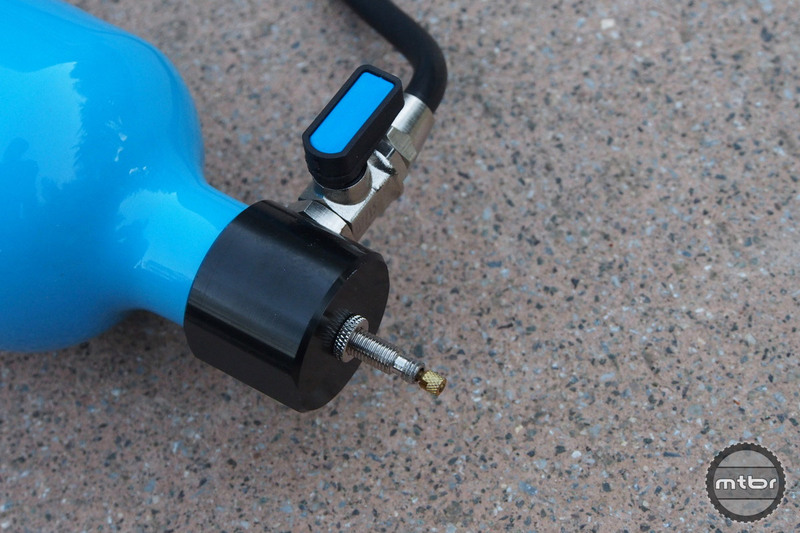 Airshot Tubeless Inflator has a presta input valve. The blue knob controls the output flow (click to enlarge). The Airshot Tubeless Inflator is a new product entering the market and it hopes to address this problem with a light, portable compressed air canister. This model holds 1.14 liters of air at up to 160 psi. It is pumped up with a floor pump connected to the input presta valve. The compressed air can then be used immediately or stored for later use. Airshot Tubeless Inflator outlet valve with the valve core replacement (click to enlarge). 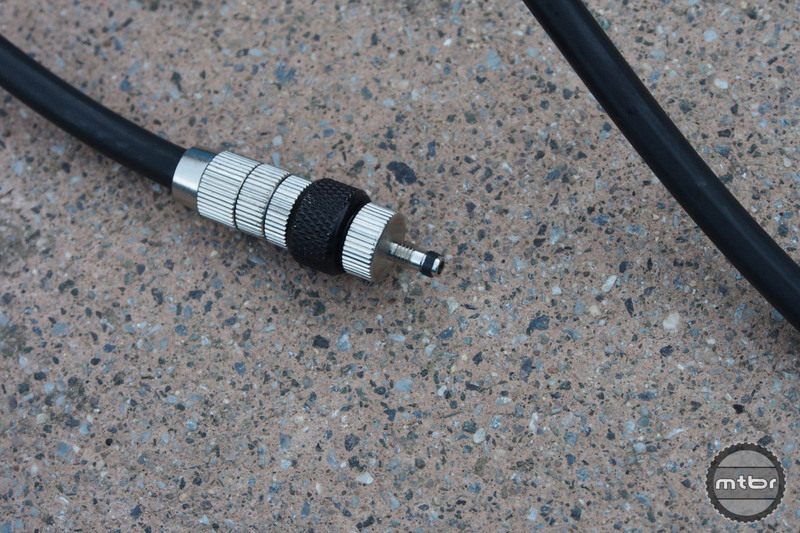 To use it, the output hose is connected to the presta valve of a tubeless tire and a release lever is turned 90 degrees for maximum airflow. This worked well in several of our tests to inflate tires that would not inflate using a floor pump. How does it perform compared to the Bontrager Flashcharger you have next to it? Does one have more volume capacity than the other to help with stubborn tires? I have used both the Bontrager Flashcharger and the Airshot. Personally, I’ve had more success seating tubeless tyres with the Flashcharger than the Airshot. As a complete system the Flashcharger simply cannot be beat – so far. The latter, to me is just a novelty. No guesses which one is now part of my toolkit. You could always get multiples of these and daisy-chain them for more volume. That would probably seat even the most stubborn setups. That airtank is beyond expensive given the material cost. Even a piece of PVC-pipe will do the trick or if you want to get fancy use a worn-out paintball airtank or fire extinguisher. All of these are to be had at a fraction of the cost. That would be insane to carry this thing around. Just get a motorcycle at that point. Woah, there really is one born every minute. But who am I kidding… they’re going to sell a lot of these. Can it be used to inflate a car tire? If so, I’d keep on in my truck and could justify the price.